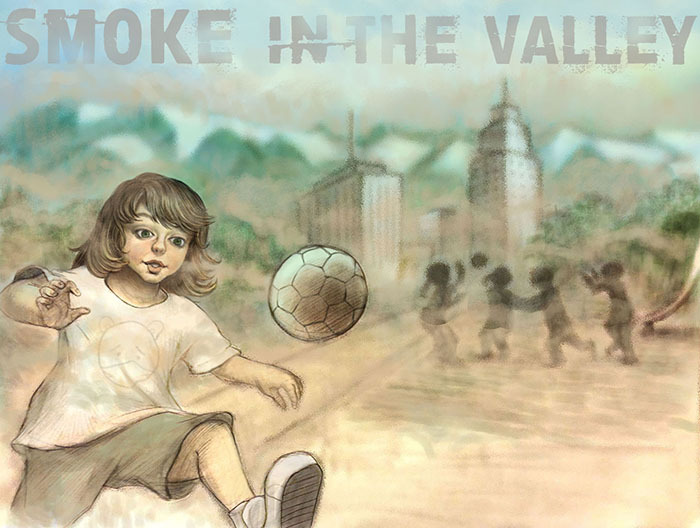 Fresno’s pollution burrows deeply into the lungs of its asthmatic children. Kerry Klein peers through the haze. Illustrated by Leonardo Alannis and Daisy Chung. One night a few years ago, Natalie Sua was watching television at her home in Fresno when she noticed movement across the room. Her five-year-old son Javier looked like he was convulsing. She lifted his shirt and discovered his chest and stomach were retracting. Javier was struggling so hard to breathe he couldn’t even wheeze. Sua rushed Javier to the emergency room, where doctors explained that he was having an asthma attack. Sua was shocked; he had never shown signs of the disease. “They were telling me I barely got him there in time,” the 29-year-old says. “His whole airway was almost closed." It’s some consolation, then, that when Javier’s younger brother Ezekiel experienced stomach retractions not long after, Sua recognized the signs. Off to the ER he went. He’s returned three times since that first episode; Javier’s been back four times. The two brothers, now nine and five years old, are not alone in Fresno. Roughly one in five children in this California city have been diagnosed with asthma, far more than the national average of one in 11. Throughout the city, asthma attacks account for thousands of ER visits each year. Fresno’s high rates of asthma are no surprise given its dismal air quality. In 2014, the National Lung Association named the Fresno metropolitan area the worst in the country for fine airborne particles. On smoggy days, a simmering brownish haze obscures the Sierra Nevada peaks rising in the distance. Researchers long ago drew a straight line between air pollution and health problems like asthma and allergies. But they haven’t always known how pollutants do what they do. A study published in late 2014 shows that noxious airborne particles dig deep into our bodies. They bore through the lungs, into the blood and then inside our cells—deep enough to tell our genes to switch off some of the immune system’s important functions. 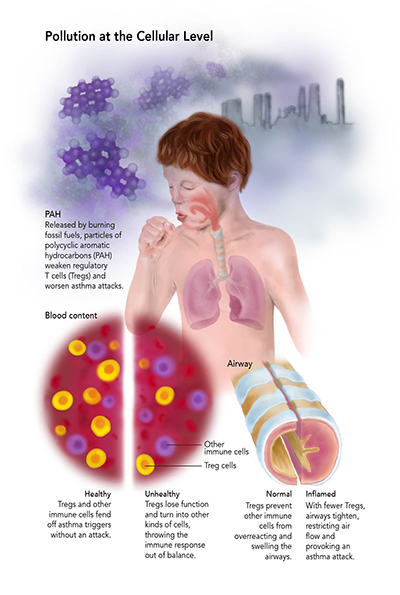 The result is kids who are more predisposed to asthma, who suffer worse asthma attacks, and who are more likely to develop other allergic diseases like hay fever and eczema. In reality, these are consequences of more than pollution. Fresno’s lung problems are a clouded mess of geography, industry and socioeconomics. Until these factors can be disentangled, researchers hope to paint a clearer picture of what’s happening to kids and figure out how to help them. Fresno lies at the heart of California’s San Joaquin Valley, a 60-mile-wide swath of farmland stretching from Bakersfield to Stockton. The fifth-most populous city in California, Fresno feels like an oversized suburb. Vineyards and orange groves surround its sprawl of palm-lined avenues and one-story bungalows. Drive an hour or two in almost any direction and you'll hit mountains: the Sierra Nevada to the east, the Coast Ranges to the west, and the Tehachapi Mountains toward Los Angeles to the south. On a clear day you’d swear you could see 90 miles to Half Dome, Yosemite National Park’s famed granite rise. Other pollutants are toxic without the sun’s help. Fine specks known as particulate matter are the valley’s wintertime air problem. Particulates range from mineral dust kicked up from farm fields to soot expelled by gasoline engines and burned wood. Any time you see smoke or exhaust, says Wexler, particulates are cycling into the air. The finer they are, the more easily they lodge in the lungs. 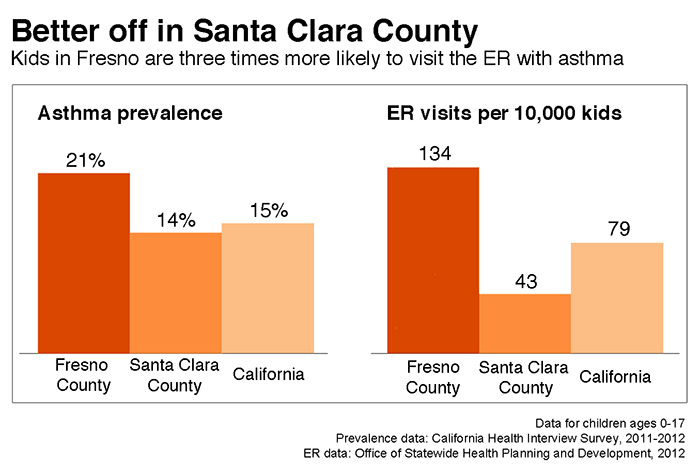 Asthma is not an equal-opportunity disease in Fresno. It hits poor and non-white residents the hardest because of where they live: in neighborhoods closer to factories and highways and further from public transportation. Famously depicted by novelist John Steinbeck, the San Joaquin Valley contains some of the country’s richest agricultural land and some of its poorest residents. For more than a century this land has attracted farm workers from Latin America, Asia, and other regions. Today, Fresno is made up of close to 50 percent Latinos and 20 percent Asians and African Americans. In 2010, one-quarter of the city's residents fell below the poverty line. Podcast produced by Kerry Klein. Click on image to play. Low income brings high health risks, says Jonathan London, director of the Center for Regional Change at UC Davis. “They’re farmworkers working minimum-wage jobs,” he says. “There are issues with access to resources like health insurance” and preventive care. Historically, says London, city officials overlooked communities with low rates of education and English fluency. “They generally blasted through lower-income communities and communities of color,” he says, building highways and factories practically in back yards. From there, says London, the health impacts pile onto one another. Many low-wage workers can’t afford cars, but beyond the city’s main economic zones, buses come infrequently. “Some people may spend more time outside waiting for the bus, or walking, or transferring three times to get somewhere,” says London—all while breathing in their neighborhood’s dirty air. These factors amass into what London calls a cumulative health burden. The state Environmental Protection Agency has compiled these and other factors—such as water access and pesticide exposure—into a ranking of the state’s most at-risk areas. Residents of one zip code in southwest Fresno face more health risks than anyone else in California. Their neighborhood is wedged between three highways; meat and dairy processing plants spew noxious fumes into the air. The cost to life spans is huge. Residents of another zip code in southwest Fresno die 21 years sooner, on average, than in Fresno’s wealthiest neighborhoods. Javier and Ezekiel Sua live nearby in west Fresno. Nadeau called the National Institutes of Health (NIH). “I said, 'This is amazing. What's going on in Fresno? '” Once she learned about its air problems, she wondered whether pollution could weaken immune function. Recent research had shown cigarette smoke could do so. She asked where she could get her hands on more blood samples from Fresno. The NIH pointed her to researchers from UC Berkeley who had been studying the health effects of air pollution in Fresno since 2000. 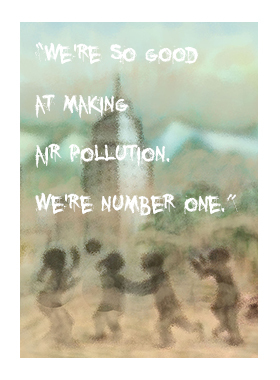 Nadeau became part of the Children’s Health and Air Pollution Study (CHAPS) when it made its debut in 2010. 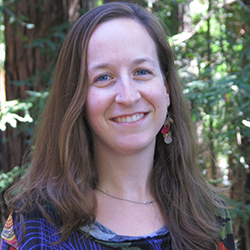 Her work is just one arm of the research; other scientists study links between pollution and birth weight, premature births, and neighborhood-scale health variations. Standing at more than six feet tall, with a mane of white-blonde hair, Kari Nadeau is a force of seemingly boundless energy. Her days are booked to the minute with meetings and visits with patients—and her five children. But her lopsided smile and bubbly laugh persist through her packed schedule. 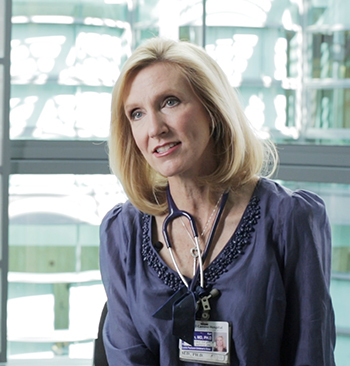 She gives her patients a private cell phone number and will answer it at any time of night. Immunologist and pediatrician Kari Nadeau of Stanford University. Nadeau’s office in crisp, clear northern California is a far cry not just from Fresno, but also from where she grew up. As a kid she suffered from bad allergies and asthma, an affliction she blames on living near the industrial city of Newark, New Jersey. She learned in college that allergies are mediated by the immune system, and she’s been fascinated by it ever since. After earning an M.D.-Ph.D. at Harvard, she came to Stanford for a residency in 2003 and stayed there as an immunologist and pediatrician. Early in her Stanford career, she made waves when she developed an edgy treatment for multiple severe food allergies. It involves giving kids regular shots containing minuscule amounts of the foods to which they’re allergic. The New York Times named her “The Allergy Buster,” but in Fresno, she’s more like an allergy whisperer—trying to coax out the reasons why allergic diseases like asthma are so common. During an attack, a person’s airway constricts in response to triggers like pollen and mold. Asthma is typically chronic, without a cure. But with proper medication and control, asthma sufferers can minimize their symptoms. In some cases, it's as simple as avoiding homes with pets and carrying around an inhaler. But for others, like Javier Sua, an emergency room visit is all that will open up the airway. In a 2010 study, Nadeau demonstrated that kids in Fresno even without asthma have weaker Tregs than asthmatic kids in Stanford. The reason: sooty particles called polycyclic aromatic hydrocarbons, more common in Fresno than in Stanford, stifle Tregs. Nadeau wanted to know why. She sequenced the DNA in the weakened Tregs and found that a gene called FOXP3 was being suppressed. With less FOXP3, the peacekeeper cells first get worse at their jobs. Then, they transform into other families of T cells—specifically, the kinds that exacerbate the immune response rather than calm it down. The process behind FOXP3 suppression is DNA methylation, in which a molecule called a methyl group clamps down on a chunk of DNA and prevents it from being expressed as a gene. Referred to as an “epigenetic” change, methylation doesn’t affect the DNA itself, just how it’s expressed. But without being treated or reversed, epigenetic changes linger. They can be passed down to daughter cells when the parent cell divides, making them heritable along with the DNA itself. Nadeau also wants to determine whether these epigenetic changes are permanent. They could be, she says, but her experiments have shown that some treatments can reverse them. “Your parents might have given you allergy genes,” she says, but targeted immunotherapy—like the therapy she developed for food allergies—can chip away at the methyl groups they passed down. Both Nadeau and Katharine Hammond hope CHAPS will inspire policy changes to improve Fresno’s air quality. Nadeau points to the cigarette industry, where research successfully influenced how cigarettes are marketed and taxed. “In certain scenarios, where there was a link between environment and disease, policy got changed,” she notes. Statewide smog checks and tighter diesel regulations already have helped reduce the exhaust filtering into the valley. The air district’s campaign with David Lighthall to cut down on wood smoke has been successful, too. “Despite how bad things are, they’re actually getting much, much better,” says John Capitman, executive director of the Central Valley Health Policy Institute at California State University, Fresno. But still more could be done. Widespread public transportation and better urban planning could cut back on vehicle exhaust. It could also keep people off busy streets on bad air days. Natalie Sua wishes more advocacy groups would raise awareness of asthma and its causes. She attributes recent upswings in her sons’ health to the Central California Asthma Collaborative, a non-profit that helps families reduce asthma triggers at home and at school. It’s the only program of its kind. Meanwhile, Javier tries not to let asthma slow him down. He plays soccer and races around the school track with his friends. His mom makes sure he always carries his inhaler and takes lots of breaks. But she still worries about him and Ezekiel. And she wonders if her other three children will experience breathing problems of their own. “If I could just get up and move, I would,” Sua says. But she probably won’t. If Fresnans feel anything toward their hometown, it’s a bulldog-like pride. They stick with their city through thick and thin, good air days and bad. During my second year of college, Al Gore’s “An Inconvenient Truth” went wild in theaters. I remember lamenting with a friend that it took a politician to raise the climate alarm. That night we half-jokingly hatched an idea: Wouldn’t it be great if we found a way to translate science directly to the public? Eight years and many left turns later, I’m finally headed in that direction. An early career as a geologist inspired me to explore this rock we call Earth, but dabbling in policy with the Department of Energy showed me I could do more than research. Only after hitting the airwaves with the Science Podcast and public radio did I discover how rewarding media could be. Now, it’s my turn to help people connect with their home planet—without the partisan politics. Born and raised in Hollywood, Leonardo took an acute interest in both drawing and nature since he was very young. While obtaining his undergraduate degree, he accumulated experience in fine art, cinema, animation and public radio communications. 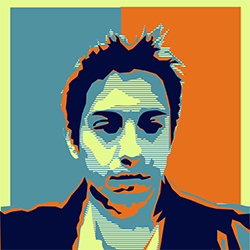 He enjoys working with both traditional media as well as digital programs like the Adobe Creative Suite and 3D modeling software. His mission is to illustrate the deep aspects of evolutionary history and bring about an understanding of our place in the natural world. 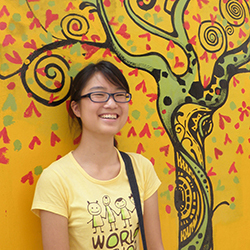 Daisy is a scientific illustrator originally from Taiwan and New Zealand. From a young age, she has woven between the worlds of art and science, pursuing dual passions that she first thought of as being irrevocably distinct. However, she found a way to articulate her competing desires when she discovered the field of scientific illustration. Daisy is passionate about conveying complicated scientific concepts through distilled visualizations. She sees herself not only as a scientific illustrator, but an educator, bridging the gap between scientists and the public with visual media in journals, children’s books, animations and educational infographics. When not working on illustrations, you can find Daisy running around, hiking in the woods and baking her favorite desserts!